Noriyuki Nakayama 6P, who died last week (EJ Special Edition 2/19) was famous for creating original ladder problems, including a series with the black stones in the shape of the oriental zodiac signs. The attached problem is for the sign of the monkey. Note that the monkey is winking its right eye. The problem is translated by Bob McGuigan from Nakayama’s book Shicho no Sekai (The World of Ladders) published by the Nihon Ki-in in 1998. 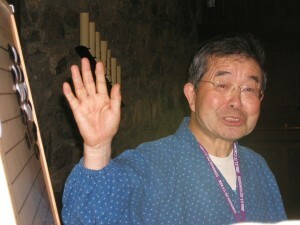 Nakayama noted that several go players were born in the year of the monkey, including Sakata Eio, Cho Chikun, Sugiuchi Masao, Fukui Masaaki and Nakayama himself. The problem is Black to play at A; can he capture the white stone at Q9 in a ladder? The solution is 119 moves long; watch for the solution next week. BEHRENDT BLITZES BOCHUM: Jens Behrendt 1k won the first full handicap Bochum Blitz February 20 in Bochum, Germany, posting a 6-2 result while former German Champion ‘Kaiser’ Franz-Josef Dickhut 6d topped a group of five with 5-3 results. Among the 14 participants was also ‘kyu-killer’ Horst Sudhoff, well-known to U.S. Go Congress attendees, over 80 years old and 1d now, who also won a game with the ‘Kaiser’. The Winter Bochum Blitz was the first of what’s planned to be a quarterly event; next up is the Spring Blitz on May 8. MACKOWIAK WRAPS UP BYDGOSZCZ RAPID: Dariusz Mackowiak 2k of Poznan swept the Bydgoszcz (Poland) Rapid 4-0 on Saturday, February 20. The tourney has an ideal formula for kyu’s from all strengths, with full handicap and 5 points reverse komi for every stone over 9, and half an hour plus overtime. Bruno Walaszewski 6k and Lukasz Wierzbowski 17k led a field of five locals with 3-1 each. In the final Mackowiak won against 9 stones plus 30 points of komi. Tomasz Buczkowski 11k (Wlodyslaw) went home undefeated (3-0). 21 players ranking between 1k and 25k took part. MATEESCU MASTER OF TRIGANTIUS: Robert Mateescu 6d (Caltech) topped the Trigantius tournament in Cambridge February 20, defeating British hopeful Matthew Macfadyen in the final. Tim Hunt took third place. Further down the list were Baron Allday, Michael Pickles, Will Hornby and Alistair Turnbull, who also went undefeated. Click here http://www.britgo.org/results/2010/trigantius.html for results. CAMBRIDGE FIRST BRITISH TEAM CHAMP: The team from Cambridge have won the first BGA online league with a match to spare. In the four matches played so far they dropped just one game to the fell hand of Matthew Macfadyen. The victorious Cambridge squad is composed of Alex ‘Infinity’ Selby, Dave Ward, Andrew ‘The Great Destroyer’ Kay, Andrew Simons, Phil Beck and Graham ‘Sensible’ Philips. Competition for second place is still fierce, with Durham, Dundee and St Andrews, and Leamington all in with a shout. – Ian ‘Javaness’ Davis to www.EuroGoTV.com. Click here http://league.britgo.org/league.php for the current standings in all four divisions. PODPERA TOPS CZECH YOUTH: Lukas Podpera 3d easily confirmed his status as best Czech youth, sweeping the under-16 national title 6-0 in Prague, February 13-14. The top three were boys, but girls dominated in numbers, with 10 of 15 players. A girl, Kamila Samajova 18k, won the under-12 title. Click here http://www.goweb.cz/node/2733 for results. A week later, Podpera also did well in Barcelona (see above), where he won four games; among his victims was Antoin Fenech 5d (France), while he only lost to Hwang In-seong 7d. A week earlier he had won bronze in Erdingen. VENTURIERI WINS SWISS YOUTH TITLE: Luciano Venturieri 2k won the Swiss Youth Title, despite losing all his games. The Youth Champs were part of the regular “Solothurn Turnier” in Solothurn, February 6-7, where 39 took part, among them 4 youngsters. The ranking for the title was based on the final table. Rose-Marguerite Martin 6k won silver with one win, while Arthur Bassand 12k took home bronze with his 3 wins. Daniil Matveev 3d swept the Solothurn Title 5-0, ahead of Andreas Hauenstein 2d 4-1 (both Basel) and Lorenz Trippel 1d 3-2 (Zurich), who was third on SOS. Another tale of go behind bars – this one from Poland – comes from E-Journal European Correspondent Peter Dijkema. Seems that Slawomir Sikora picked up the game while serving a 25-year prison sentence for the brutal 1994 murders of two men who were blackmailing him and his business partner. The case became world-famous when the film “Dlug (The Debt)” http://www.imdb.com/title/tt0225535/ came out in 1999. According to Dijkema’s sources (his wife is a Polish journalist), after learning go from a book his mother gave him in prison, Sikora and his fellow inmates made their own sets out of cardboard and paper, and when he soon had his cell-mates taking serious handicaps, they concluded he was the dan-player, while they were weak kyu’s. The film helped Sikora become a hero in the eyes of many and he was freed in 2005, pardoned by the President of Poland after many prominent Poles signed a petition on Sikora’s behalf. “We do not know of any of his games outside jail, nor how his dan-level would match up on the Polish ranking list,” Dijkema reports. Click here http://www.kinokultura.com/specials/2/dlug.shtml to read more about the case. NAKAYAMA’S LAST LECTURE: Longtime Congress favorite Noriyuki Nakayama 6P announced at the 2006 US Go Congress that it would be the last year he’d be attending the U.S Go Congress. His wife had been ill recently and it was a great hardship for him to be away for the month it took to attend both the U.S. and European Congresses. 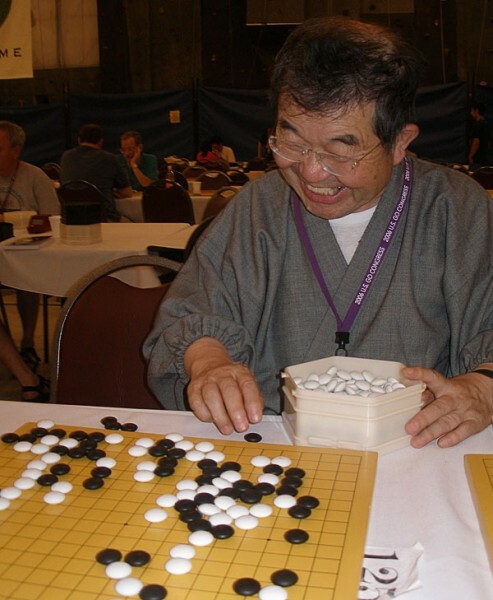 At a standing-room only lecture at the Congress, the irrepressible Nakayama said that “I’m afraid the answer might be ‘jigo’ if my wife asks me which is more important, my American go friends or her.” Much-loved for his cherubic delight in teaching go to players of all strengths, Nakayama said “The best thing about go is that you make many friends.” At the lecture, he set up two life and death problems and invited members of the audience to come up and try to solve them, gleefully refuting the wrong moves until somebody solved the problem correctly. For the game section of the lecture, he showed part of the game he won to get promoted to 2P. I participated in the US Go Congress this year (2006) as I have for last 21 years. The US Go Congress, which started in 1985, could just as well be described as “the US Open Go Festival.” Participants include players from European countries, Japan and many other countries who love this “Festival” as well as go enthusiasts and go maniacs from every corner of the United States. For many participants, these events are a vacation involving spouses and other members of the family. 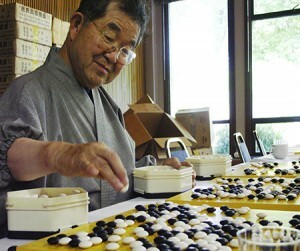 Many wives and children learn go and participate in events like Pair Go, the 9×9 tournament and Kid’s Go. 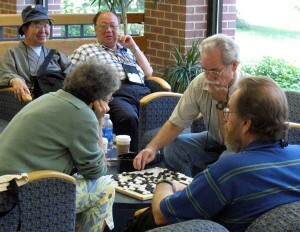 I have been engaged in activities to introduce and popularize the game of go in the USA before the US Go Congress was organized, but unfortunately, this year’s visit will be the last one due to my wife’s health problems. I know that I will miss the Go Congress and my friends there very much since I started this journey when I was 49 and it has lasted a full quarter-century since then. On August 19, 2006, my last lecture started after all the Congress events were finished. It had become a kind of Congress custom for me to present a lecture as the final event but this year’s — literally “the last lecture” – attracted most of the approximately 250 people at the Congress. In the standing ovation which lasted long after I finished, overwhelmed by the emotion, I could not find the words to say Goodbye Go Congress, Goodbye America, Goodbye my dear American go friends! - A longer version of this letter appeared in the October 9, 2006 edition of the Nihon Ki-in’s weekly Go magazine. Translated by Frank Fukuda and edited by Chris Garlock. This letter also appears in the 2006 American Go Yearbook. A little before six in the evening, Kajiwara, who had been glaring at the board hard enough to bore a hole in it, suddenly raised his head and glanced at the scenery outside in the gathering dusk. Not surprisingly, he bore signs of considerable fatigue. Kajiwara gave a deep nod of assent, then shifted his gaze back to the board. Some five minutes passed by. Suddenly he called out in a flurried tone, “What? The next move’s the sealed move.” His eyes were riveted on the board. 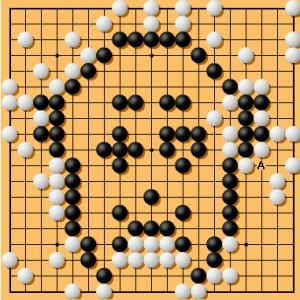 With his whole being concentrated on the go board, Kajiwara had only half taken in the game recorder’s words when he first spoke. “Yes. The next move – is – the sealed move.” The game recorder replied slowly and carefully, enunciating each syllable clearly. IN MEMORY OF NAKAYAMA SENSEI: A number of Nakayama appreciations, tributes and memories has been posted on GoDiscussions.com http://www.godiscussions.com/forum/showthread.php?t=11152 , including a record of a game between Nakayama and Kojima Takaho, which made the Kido yearbook’s section on noteworthy games, posted by John Fairbairn. Contributors: Paul Barchilon (Youth Editor); Lawrence Ku (U.S. West Coast Reporter); Brian Allen (U.S. West Coast Photographer); Keith Arnold (Go Quiz); Peter Dijkema (Dutch/European Correspondent); Marilena Bara (Romania/European Correspondent); Ian Davis (Ireland Correspondent); Jens Henker (Korea Correspondent); Nicholas Roussos (Cyprus Correspondent); Horatio Davis (Australia/New Zealand Correspondent). Articles appearing in the E-Journal represent the opinions of the authors and do not necessarily reflect the official views of the American Go Association. The Pair Go team of Feng Yun-Jie Li will represent North America at the World Pair Go Association’s 2010 World Cup, after defeating Jin Yu-Jing Yang in last week’s North American Qualifier. The Cup is scheduled for March 20-23 in Hangzhou, China. 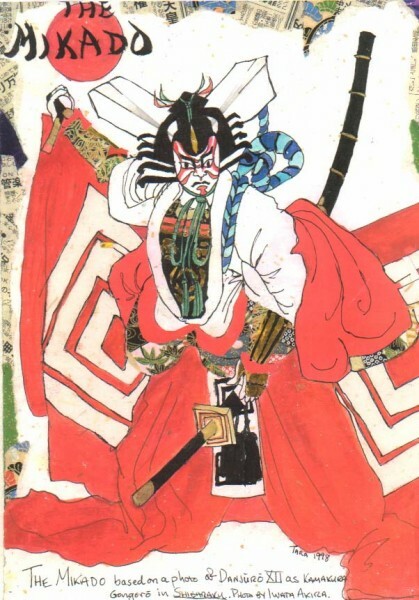 In related news, in honor of the 20th anniversary of the International Amateur Pair Go Championship, the Japanese Pair Go Association has just published ten essays about Pair Go. 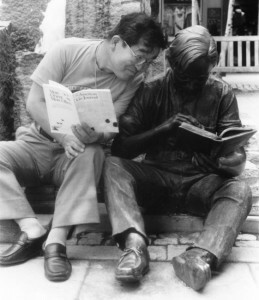 Manja and Micha Martz won first place with their thorough, entertaining and well-illustrated essay on the history of Pair Go in Europe and longtime U.S. go organizer – and IGS rep –Thomas Hsiang contributed A Few Memories of Pair Go, noting that “Pair Go has not only been accepted but flourished beyond anyone’s imagination. 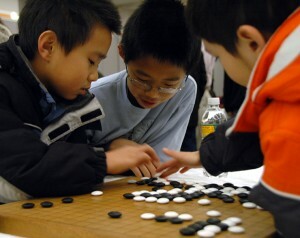 Aside from frequent regional tournaments held worldwide, Pair Go was featured as the only mixed-gender mind-sport in the First World Mind Sport Games in 2008 and will be a medal event in the 2010 and 2014 Asian Games.” Hsiang also points out that “the US go scene that was once almost exclusively male-dominated now sees a much greater participation by female players, especially among the young….Pair Go has brought together many couples in US and Europe, and not a single couple has been broken up by it!” Click here http://www.pairgo.or.jp/event/pairgo20th/index-e.htm to read the Pair Go essays. Plans are afoot once again to stage the world premiere of “The Honinbo” http://www.usgo.org/resources/downloads/Honinbo.pdf go musical at the 2010 U.S. Go Congress. 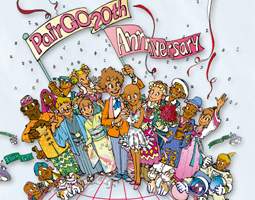 The full-scale parody of “The Mikado” was penned by former AGA president Bob High, and features a cast of go playing characters singing go-themed songs. “We have obtained cooperation from the UCCS Drama department to get facilities and some student assistance,” reports Chris Kirschner, who’s had a longtime dream of producing the musical. “Our job is to get a cast together and prepare to make good use of them. Plans are just starting, so we are looking for volunteers to launch this production. Mainly, we need people willing to get up on stage and play the parts. There are 10 named roles, and several choruses. Some musical ability is desirable, but don’t hesitate for lack of a voice of gold. And we will want some production people back-stage as well.” Contact Kirschner at operations@usgo.org for details. HANE NAOKI TO PLAY KONO RIN IN NEC CUP FINAL: Hane Naoki (NEC) and Kono Rin 9P will face each other in the 29th NEC Cup final match after winning their respective semifinal matches against Ko Iso 7P and Yamashita Keigo (K). Both victories were by sizable margins of 7.5 points. Hane was seeded into the second round, where he defeated Cho U http://www.gogameworld.com/gophp/playerinfo.php?id=19 9P before meeting Ko Iso. Kono started off by defeating Iyama Yuta http://www.gogameworld.com/gophp/playerinfo.php?id=379 9P, then Kataoka Satoshi http://www.gogameworld.com/gophp Click here http://www.justplaygo.com/ for the games. LEE CHANGHO ADVANCES TO KUKSU FINALS: Lee Changho 9P defeated Joo Hyeongwuk 5P by resignation in the semi-final match of the 53rd Kuksu (National Champion) tournament on February 10. Lee will face either Hong Kipyo 4P or An Hyungjun 2P in the tournament finals. The winner will play current Kuksu title holder Lee Sedol in the title match. Lee Changho has held the Kuksu — Korea’s highest honor in professional tournament play — nine times and played in 16 of the last 20 Kuksu title matches. LEE CHANGHO AND LEE SEDOL PLAY TO HELP HAITI: Lee Changho and Lee Sedol played a benefit match last week to help the victims of Haiti’s devastating earthquake. Charitable donations for the refugees were raised through the Go TV broadcast of the game and given to the UNICEF South Korea Committee. The game was the idea of go sponsor Kingsfield Ltd, which has just signed an advertising contract with Lee Sedol. Lee has not met Lee Changho since their three-game match-up in the KBS Cup final 11 months ago, so there was great interest in their first encounter since Lee Sedol’s reinstatement in January. The players waived their usual fees. Although it was a “real game”, the result didn’t really matter, the players said, and they concentrated on producing an entertaining game. Lee Changoho won. Click here http://www.justplaygo.com/ for the game. THREE-WAY TIE IN HONINBO LEAGUE: With only two more games for the players in the Honinbo League http://www.gogameworld.com/gophp/pg_titlelist_detail.php?title=Honinbo to determine the challenger for the title held by Hane Naoki http://www.gogameworld.com/gophp/playerinfo.php?id=22 9P, three players have records of 4-1. Iyama Yuta http://www.gogameworld.com/gophp/playerinfo.php?id=379 9P, who had the lead earlier with 4-0, lost to Yamashita Keigo http://www.gogameworld.com/gophp/playerinfo.php?id=45 9P, who is also at 4-1. The third player is Takao Shinji http://www.gogameworld.com/gophp/playerinfo.php?id=214 9P. Of these three, only Takao has held this title–he was Honinbo for three years, 2005-2007; he lost the title to Hane in 2008, and Hane defended it successfully in 2009 against Takao as challenger. Winner David Ward 3d (Cambridge) had the last grin when the Cheshire tournament returned after a year gap for the British in Chester and ran again alongside the Frodsham Chess Tournament on February 13. Ward beat Sam Aitken 3d (Warwick) in the final. In the Handicap Section, Justin Neeves 7k (Manchester) was the winner at 5-0. On 4/5 were Jack Ley 8k (Warwick) and Brian Timmins 9k (Shrewsbury). Jamie Taylor 5k (York) was the top junior winning 3-2. 28 players took part. Click here http://www.britgo.org/results/2010/cheshire.html for results. PEDERSEN WINS AMBASSADOR’S CUP IN DENMARK: Torben Pedersen 1d won the Japanese Ambassador’s Cup in Copenhagen February 13-14, undefeated in six rounds. This full handicap tournament offered chances to kyu players: Jeppe Juul 4k lost only to Pedersen and took silver, while Rasmus Bisschop-Larsen 7k won bronze, with best SOS of those with four wins. All winners and a majority of the 24 participants came from the organizing Kobenhavn Go Klub. Click here http://www.kgok.dk/res/ambcup10r.html for results. GERLACH GRABS GÖTTINGEN: Current German Champion Christoph Gerlach 6d swept the A-group of the 19th Göttingen Open last weekend, ahead of Willem-Koen Pomstra 5d (4-1) from Holland and local Marion Welter 3d (3-2). From B-group Dutchmen Gijs van Swaaij and Zeno van Ditzhuizen (both 1k from Utrecht) moved to A-group on Sunday, where they continued to win. Click here http://www.dgob.de/tourn/tourn.cgi?f=10degoe1.txt&mode=cml for the A-table with 18 and here http://www.dgob.de/tourn/tourn.cgi?f=10degoe2.txt&mode=cml for the B-table with 34. KARLSRUHE NARROWS GAP WITH HEBSACKER IN GERMAN LEAGUE: Karlsruhe defeated Hamburg St. Pauli in the sixth round of the German Bundesliga on February 11, while leader Hebsacker (also from Hamburg) drew Berlin Blunders. With three rounds left to play, Hebsacker leads Karlsruhe by a single match-point. With two lost matches and a draw, the Frankfurt Dragons are third. Next month, Frankfurt meets Karlruhe. The Hebsacker-Karlsruhe top-match is scheduled for April. In the final round in May, Hebsacker will face the Dragons and Karlsruhe Berlin Igoist, now in 4th place. THREE TOP LEUVEN: Despite losing the last round to emerging star Kim Ouweleen 1d from Amsterdam (Holland), Jan Bogaerts 3d from Le Pantin (Brussels) still finished first on SOS in the jubilee 20th Leuven Open – celebrated with home-baked cakes – in Belgium on February 6-7. Huang Yong Sen 3d also won four, to take silver. Marie Jémile 4k and BGF-President Cédric Declerfayt 5k (both Le Pantin) won all five. 43 players participated. 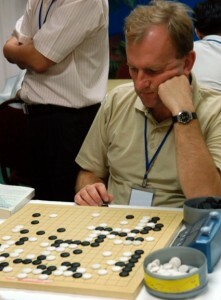 Click here http://www.gofed.be/tournament/results&tournament=LEU&year=2010 for results. GERMANY UPDATES: Danek Dominates Erdinger: Veteran Vladimir Danek 5d (Prague) swept the 13th Erdinger tournament in Bavaria, Germany the first weekend of February, ahead of Jonas Fincke 4d (Munich), while 15-year-old fellow townsman Lukas Podpera 3d took home bronze on SODOS, ahead of Thomas Kettenring 3d (Munich). In the field of 128, only Stefan Fischmeister 5k (Linz, Austria) also won all five. On top of 128 in the main, five more players showed up in Erdingen just to compete in the 13×13-marathon. 1st Bochum Blitz: The Bochum club, already famous for its yearly Bambus (‘Bamboo’) tournament, now lays more claim to fame with their seasonal Bochum Blitz. The first Blitz will be this Saturday, February 20. Participation is free. For details, or to sign up, click here http://www.dgob.de/lv-nrw/bochum/?Blitzturnier:2010 and then click on “mailformular”. MACFADYEN WINS WANSTEAD: Matthew Macfadyen got his first tournament win of the year at Wanstead, which returned to its early-year spot on January 30) at the same Wanstead House venue in East London. Other players winning all three were: Mike Cumpstey 3k (Manchester), Eric Hall 5k (Swindon) and Gary Gibson 7k (Wanstead). 32 players participated. Click here http://picasaweb.google.com/igokailondon/Wanstead100130?feat=directlink# for a gallery of photos. DANIGABI KEEPS LEAD IN KGS INSEI LEAGUE: Argentina’s ‘danigabi’ has increased his unbeaten lead in the February KGS Insei League to 13-0, while ‘ha’ had moved into second place with 4-2, ahead of 2-1 by both ‘Artem92′ and ‘malexander’. Like ‘ha, ‘Arlequ1′ is from France. Meanwhile, a debate has begun on go-sensations about whether the winning percentage is a fair measure. “A 20-2 result should be better than 12-0,” according to ‘danigabi’, while others argue that a player might be inclined to stop competing after a good initial score, while others would like to challenge him and play as much as possible, because of the free commentaries earned for every four games played in the league.